University of Illinois PhD student Rajinder Sodhi and Disney Research’s Ivan Poupyrev published a prototype of a device that creates a standing, tactile, controllable, air-wave. The air pressure produced by this prototype is tactile and can be linked with Kinect, and similar devices, to function not only on a passive three dimensional virtual world but in a virtual world that has a variable and controllable tactile and physical dimensions. Even though we are traditional Ninjutsu practitioners, I write about technological and thought provoking insights that have helped not only the documentation of our tradition using a highly semantic wiki but will, in the future, assist learning, practicing and teaching using new devices that will incorporate depth, tactile information and other variables. As I look at it, the difference between a boxing bag or a wing chun wooden dummy and the AIREAL devices is not essential. As a training aid these just differ in technology. Ten minutes after clearing the dojo because of the alarm that precedes the rockets that were fired toward Tel Aviv. We were training on Shoshin Gata from the techniques of Gyokko ryu. We just resumed training. To all the spouses, we have a ‘state of art’ bomb shelter on the grounds. A street fight is a combat situation, not a martial sport. In this short skirmish from Russia, a guy, armed with pepper spray and a video camera held by his girl friend, goes into a fight with an armed opponent. While disobeying most of the rules of combat we learn, he still manages to not get killed and looses only a finger. July the 2nd, at China’s Guizhou Normal University was the scene of a brutal knife attack. A mentally disturbed student armed with a 50 cm, large machete like knife barged into the campus towards the cafeteria. As the security guards were trying to stop him, two were stabbed to death. What we can see in the car’s side view mirror is a Kong Fu practitioner (probably Zhang Huaiqian) waiting patiently for the correct moment. 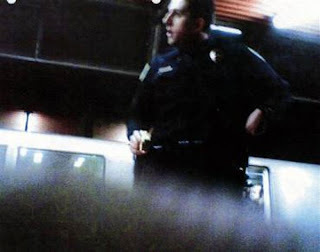 The attacker that uses a long pole at the beginning draws the knife, turns around and stabs the security guard, when he turns away the Kong fu hero proceeds to knock him down with a high flying kick and then proceeds, with several bystanders, to strike the attacker into submission. A truly brave display of courage and ability. It is often important to remember that however technology may have evolved, the people who use this technology have not. An example of this fact can be seen in the use of swords in modern warfare. I recently came across an article by Bou Jean which examines the introduction of sword usage into the Australian Mounted Division’s training programme in 1917-1918. Although never considered as a replacement for modern firearms, the sword became an important element of shock tactics when charging Turkish machine gun positions: “the rapid rush of the horsemen and the sight of the steel had its usual unnerving effect.” (123) The intimidation of encountering mounted sword-wielding enemies has clearly not diminished. Bou, Jean. “Cavalry, Firepower, and Swords: The Australian Light Horse and the Tactical Lessons of Cavalry Operations in Palestine, 1916-1918.” The Journal of Military History 71.1 (2007): 99-125. Project MUSE. 9 Apr. 2010 . It transpires that telling people they can’t buy guns is exactly what improves firearms sales. Recent market research shows that the sales growth outlook for the coming years has dropped significantly, supposedly due to the revelation that the Obama administration did not intend to impose any restrictions on firearms ownership. Similarly to my intentions to stockpile beer prior to the recent increase of alcohol prices in Israel, Texans fearing that democrat driven laws would prevent them from arming themselves for the coming apocalypse rushed to stores to buy ammunition and weapons. Great minds think alike, eh? Following the recent terrorist scare after the Mumbai terrorist attack Indian youth are looking for ways to foster their personal security. 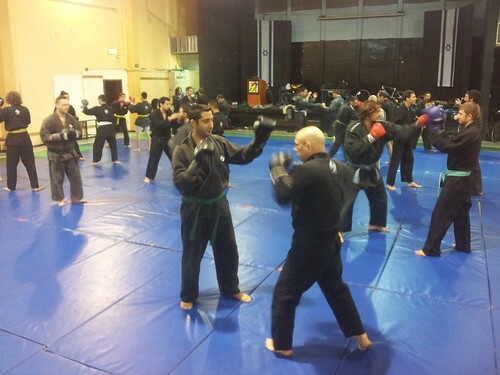 The Israeli system of Krav Maga seems like a natural choice since it advertises itself as a martial system that is very unique and efficient. If the hype in India will be as strong as the popularity of Krav Maga in USA and Europe then we will see Vicky (Vikram) Kapoor, the head instructor opening many krav Maga training places. Want a gun with that? Just how effective traditional weapons would be against an armed truck driver is quite obvious. Instead, I think this is a job for the Ninjutsu (“martial art of distance”) technique “distancing one’s self from Kansas”. The United Kingdom is leading the Orwellian world in the number of video surveillance cameras suctioned by the public in a futile effort to control terrorism. It now seems that the huge investment and the anti privacy losses were for naught – Less then 3% of street robberies in London were solved using CCTV images. The issues involving the spread and use both of state sanctioned surveillance and video equipped private phones has the Akban thinktank pondering the implications of this visibility, both for martial arts experts and for inexperienced citizens alike.